The beautiful holy spirit orchid, whose scientific name is "peristeria elata", is the national flower of Panama. If you look closely at the center petals, you will see a little white dove, a symbol of peace and tranquility. 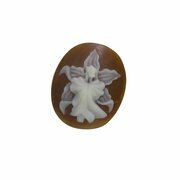 Holy spirit orchid shell cameo, 24mm oval, registry #2268. Eco-friendly, Fair trade. Sold with a Certificate of Authenticity.